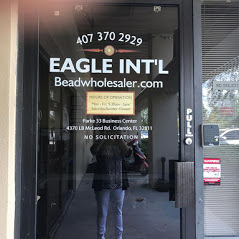 BeadWholesaler.com is the E-Commerce website of Eagle international of Longwood, Inc.
Eagle International has been in WHOLESALE beads and findings business since 1992 and is based in Orlando (World's leading tourist destination), Florida. With over 10,000 products we can easily claim to be the largest bead supplier in the Central Florida area. We supply beads to customers all over the world. We have excellent international shipping rates from Fedex. We are an Authorized Reseller of SWAROVSKI Crystal Beads, Pendant, Pearls, Rhinestones, and components; distributor of TierraCast Pewter products, sterling silver, gold-filled beads, findings, charm/pendants; bulk chains both by foot as well as finished necklaces; Tibetan/Nepalese/Boho jewelry supplies; gemstone beads and rosary chains. Our buyers are constantly looking for merchandise for you across the globe. We also bring to you many "Made in USA" products especially the entire gold-filled line, sterling silver charms/pendants, any many other sterling silver items. We believe in Quality Merchandise, Competitive Prices, Prompt Shipping and personalized customer service. We have a passion for attention to details. All orders are thoroughly checked with minutest details. You can always reach us by phone at 407-370-2929 during normal business hours (except perhaps when all lines are busy). Beadwholesaler has a showroom/Warehouse in Orlando, Florida. Please visit us on your next trip to Orlando, Florida! Please keep in mind that an appointment is required to Visit Showroom.